Vice President Mike Pence's speech at the Pentagon laid out what a new US Space Force would do. It’ll cost $8 billion to start. IF POLICYMAKING IS never easy, and military policymaking is very difficult, it stands to reason that space military policymaking is basically impossible. 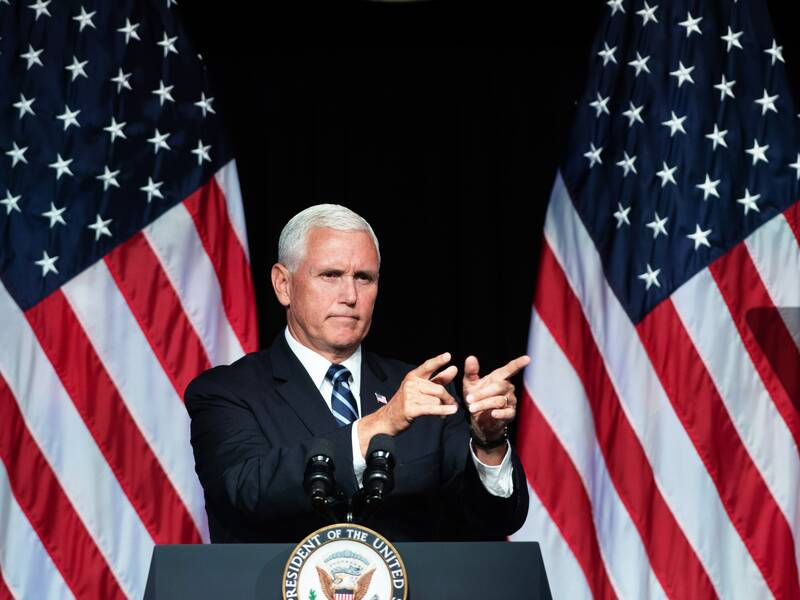 Yet today, in a speech at the Pentagon, Vice President Mike Pence announced the formation of a sixth branch of the US armed services: a SPACE FORCE! “We are glad that the Pentagon is finally taking these steps in enhancing our space strength,” said in a joint statement from Representatives Mike Rogers of Alabama and Jim Cooper of Tennessee, the ranking and minority leaders of the House Armed Services Subcommittee on Strategic Forces. They're authors of a bill to create a Space Force as a sixth branch of the US military. So ... GO. “We’re still putting it together,” Defense Secretary James Mattis told reporters earlier this week. “We have the direction from the president and we are underway.” (Mattis has, in the past, opposed the idea.) So … GO? Ish? It sure sounds like we’re go for liftoff. Pence’s speech was a lot more formal that the apparently impromptu idea Trump floated in June. Today the administration announced that the Pentagon would establish not only a new military Space Command but also a Space Operations Force, drawing together the people with space-related responsibilities across the Department of Defense, and a Space Development Agency to streamline the acquisition of military space equipment—primarily, it seems, satellites and the ground hardware that goes with them. The Pentagon can do all that. But only Congress can create a new branch of the military, and a Space Force would be the first since the Air Force became a full, separate branch in 1947. It’d be a big deal. It’s also a bureaucratic challenge, and the orders to do it come at a chaotic time across government—fights over trade, farm bailouts, skyrocketing deficits, tax reductions aimed mostly at the wealthy, ethics scandals—and midterm elections in less than four months in which many polls have the president’s party on its back foot. Into that mix the president has managed to make the idea of a Space Force seem sillier than it might actually be. On Thursday, hours after the Pence speech, the Trump campaign (for president, in 2020) blasted a fundraising email asking for people to vote on a new Space Force logo, for example. One of the options says “Mars Awaits,” as if … well, as if Mars awaits. But the idea of orbital military operations didn’t start with Trump. Just about a decade after the Air Force became a separate military branch, its chief of staff General Thomas White started talking about “aerospace,” asserting that in a future of satellites and intercontinental ballistic missiles, the Air Force’s jurisdiction was “a seamless continuum stretching from the earth’s surface to infinity,” as a RAND book on the subject puts it. And in 2001, the Commission to Assess Unites States National Security Space Management and Organization published the report named after its chair Donald Rumsfeld—before he became Secretary of Defense for the second time. The “Rumsfeld Report” warned that the US was disproportionately invested in and dependent on space assets—so much so that the nation was vulnerable to a “space Pearl Harbor." Even then, two decades ago, the report recommended a “space corps” and a rearrangement of the ways the military procured space-related equipment. A lot of reports since then have said the same. “They all come down to the same thing: Fragmented leadership and an inability to get the industrial base incentivized,” says a staffer for the House Armed Services Subcommittee working on the issue. Today, the staffer says, it takes up to two years to get a request for new gear out to industry, by which point the technology has moved on. All of which makes SPACE FORCE! a question of priorities and money. Military procurement is a mess. Whether that’s worth a massive bureaucratic restructuring of the Department of Defense and $8 billion will be up to a Congress in the middle of a political wildfire. Godspeed.